Olivier De Schutter. On transitions and resources : the political project for Europe. Watch this man : Olivier De Schutter is thinking and acting big. It is about how to intelligently design a social-ecosystemic resilient Europe. This is also the cup of tea of the Michel Serres Institute. The transition to a sustainable society requires the EU to move beyond the quest for GDP growth, and beyond top-down governance. These are the main ideas. Europe is badly in need of a new mobilizing project that maps out a bold vision for the future, and forms a pact with citizens on how to get there. The transition to a sustainable society is that project. No vision of the future can bypass sustainability. Sustainability is relevant far beyond climate change, energy use and environmental conservation. Simply cutting carbon emissions will not be enough to put our societies on sustainable footing. Ultimately it depends on our ability to shift to simpler, less environmentally-damaging modes of production and consumption. Social justice, quality of life and a sense of community are not optional add-ons in this equation - they are the very essence of a society that is able to sustain itself and its environment. In May 2014, as a recipient of the prestigious Belgian Franqui Prize and chair, De Schutter launched the EU5P International conference in Brussels. The issues the conference debated were guided by 8 questions, addressed by a panel of prestigious speakers : Anton Hemerijck, Rob Hopkins, Henri Malosse, Philippe Maystadt, Thierry Philipponnat, Kate Pickett, Jorgo Riss, Charles Sabel, Bernadette Segol, Frank Vandenbroucke, Richard Wilkinson, Arnaud Zacharie, Jonathan Zeitlin. Must we change our measure of progress ? How to move to sustainable consumption ? Are inequalities an obstacle to achieving sustainability ? Can the redefinition of gender roles contribute to sustainability ? Can finance be put in the service of sustainability ? What role should social investment play in the sustainability agenda ? Must we link trade to social and environmental standards ? How to re-imagine transitional governance ? The analysis tackles the very history of the EU construction considering that in 2014 the EU, confronted with the triple economic, social, and environmental crisis, is only able to “propose piecemeal solutions”. The founding four projects of the EU, namely the internal market ; economic and monetary union ; the establishment of an area of freedom, security and justice ; and, since the launch of the Lisbon strategy in 2000, the building of a ‘knowledge economy’, a project now central to the « Europe 2020 » strategy. At this point, the EU deserves a vision-driven upgrade. Do we need to start from scratch ? De Schutter keeps his eyes on ”The Reference Framework for European Sustainable Cities, an online toolkit for integrating sustainability into local policy”. According to him, this “could point the way forward. It is a joint initiative of member states, local governments and the European Commission that seeks to create a common space for sharing practices ‘while respecting the diversity of local priorities". Several similar initiatives are also reported. To take the message across, Olivier De Schutter has written the framing paper of the conference. As such, the paper pays tribute to the Club of Rome thinking and spirit. The spirit of “limits to growth”  has been updated  and the 1970-2010 data added  to the genuine work. According to the trends (see Figure), we seem to tightly stick to the business as usual scenario and nothing else (there were 12 scenarios looked at). If this is true, than what Turner is reporting strongly suggests that time is more precious than money : resilient systems (social, ecosystemic, financial, economic, etc) go against tenaceous wild profit and greedy power games. Turner, G. M. 2008, ‘A comparison of The Limits to Growth with 30 years of reality’, Global Environmental Change, 18, pp. 397-411. Turner, G. M. 2012, ‘On the cusp of global collapse ? Updated comparison of the Limits to Growth with historical data’, GAiA - Ecological Perspectives for Science and Society, 21, pp.116-124. 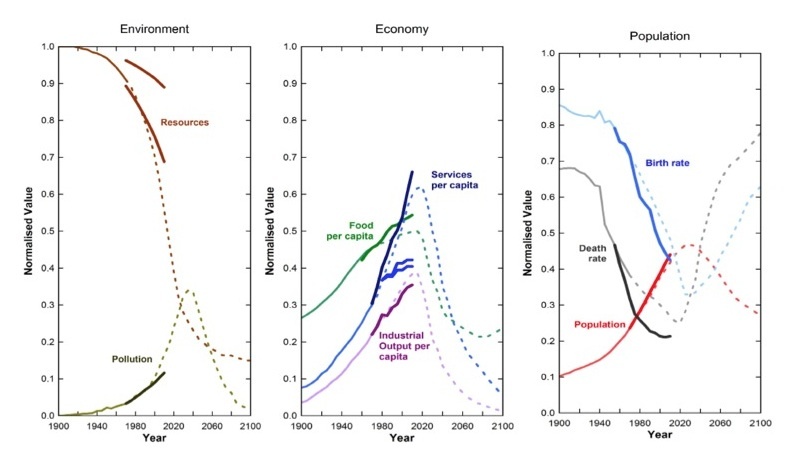 Environmental variables : global persistent pollution, fraction of non-renewable resources remaining (upper curve uses an upper limit of 150,000 EJ for ultimate energy resources ; lower curve uses a lower limit of 60,000 EJ (Turner, 2012).